Before we start, no, this is not the same as the by now ubiquitous Tuscan panzanella. There are some crucial differences. For starters, although this is a perfect way to use up leftover bread, it is also good enough to merit buying a decent loaf on purpose. Panzanella quite frankly isn’t. Above all, here the bread is toasted and left in chunks, adding not only extra texture, but extra flavour. This detail also puts it in the food-for-grown-ups category, whereas panzanella should clearly be spooned into the uncomprehending mouths of Florentine infants. Like panzanella, however, pane a caponata boasts a beguilingly simple recipe. Beguilingly because, as with any minimalist combo (a dry Martini, a pizza margherita), you have to use the best ingredients you can find, or it will disappoint. On the other hand, if you get it right, the whole is so much more than the sum of its parts. In an ideal world (and the other day, food-wise, that is where I was), you’ll be using Sicilian rustic bread; Sicilian tomatoes at the height of ripeness; fresh, grassy, single estate Sicilian olive oil; fragrant purple garlic from Nubia; basil from my pot on the terrace and sea salt from Trapani. Well, if we want to split hairs, not absolutely ideal. The tomatoes were Sicilian, but all I had at hand were the cherry variety. You really want something bigger and juicier. And by the way, make sure you also use the juice that is released when chopping the tomatoes. Presuming you have decent raw materials, this salad is practically fool-proof, not to mention quick. You can prepare the tomatoes, peel the garlic and boil the water for dunking the bread while the bread toasts, and still have time for a glass of wine. The original recipe uses chopped garlic, but I prefer to rub the cloves on the hot toast, which is then dipped in hot water, leaving only a faint, but discernible sweet garlicky aftertaste. Basil is also, strangely, missing from the traditional version, but adds colour and aroma, so in it goes. Chilli, meanwhile, is an “authentic” addition (but would have found its way in anyway). All three, of course – garlic, basil and chilli – are basically there to support the main act – the bread, tomatoes and oil. Bake the bread in a hot oven (200°C) until well toasted (5-10 minutes). Rub the bread with the garlic clove. Dunk the bread in a bowl of hot water, for a second (you want the crust to retain a slight crunchiness) and place in the serving dish. Cut into largish chunks. Add all the other ingredients and mix. Be generous with the olive oil. In fact, be generous with the seasoning in general. Leave to rest for ten minutes. Stir again, and dig in. This entry was posted in Bread and pizza, Salads and tagged recipe, salad, tomatoes, vegetable by hungryenglishman. Bookmark the permalink. Well, where to start? I guess first the title of the dish led me to expect a recipe with all the traditional Sicilian caponata ingredients, but ok, that’s not the case, not a problem. Then the reference to panzanella left me bewildered. Panzanella tipically includes sliced or diced tomato, thinly sliced red onion and cucumber so we’re talking about apples and oranges as you made clear. The only ingredient in common is the bread. So why bother to mention it? In any case the recipe turns out just fine and I am adding it to my list of good things to eat! Yes Nick, the name of the dish is confusing, but that’s what it’s traditionally called. I haven’t been able to work out why either, since as you point out, caponata has nothing in common with this at all, apart from the fact it’s Sicilian! 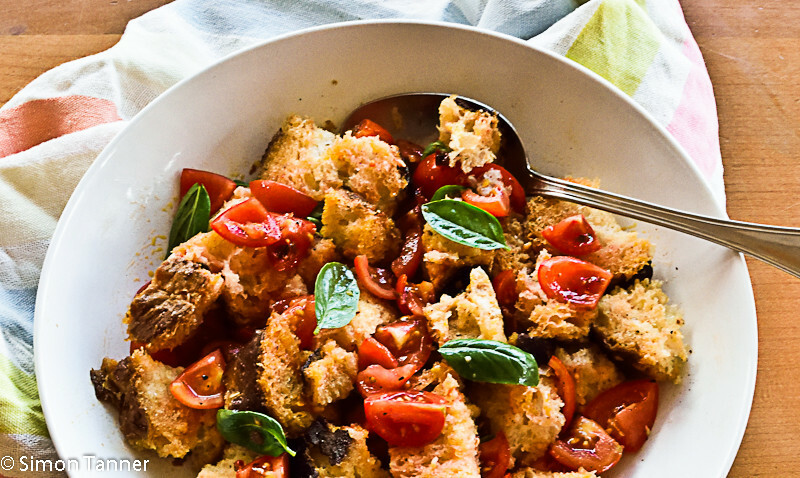 The panzanella link was based on the fact that both are salads based on moistened bread and tomatoes. The basic version of panzanella is pretty much this, with onions and cucumber being optional extras. But yes, of course, it’s a different recipe! Anyway, glad you liked it, and thanks for commenting. Hope you enjoy making and eating it!